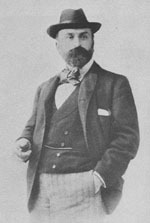 Ernest Chausson was a Paris-born composer who studied with C�sar Franck. He left behind a limited body of work mostly because of his early death from a cycling accident at age 44. Chausson is an important composer, creating a body of work that embodies the French romantic spirit. Hw wrote a number of songs for voice and piano and three works for voice and orchestra, including the stunningly beautiful Po�me de l'Amour et de la Mer, and a number of choral works. His dramatic and incidental music include his opera Le Roi Arthus. His beautiful chamber music compositions include the Trio in G minor, Op. 3, the Concert in D Major for piano, violin and string quartet, Op.21, the Quartet in A Major for piano, violin, viola and cello, Opus 30 and his unfinished string quartet, Opus 35. Chausson's orchestral works are his symphony in Bb Major, Opus 20, the symphonic poem Viviane, Opus. 5, and the famous Po�me for violin and orchestra, Opus 25 as well as the unpublished Soir de F�te, Opus 32. A breathtakingly beautiful work! A must-have. The French title of the Poem of Love and the Sea is "Po�me de l'amour et de la Mer"